Seeking to train a new workforce of HIT specialists to help providers implement EHRs, the Office of the National Coordinator for Health Information Technology (ONC) awarded $116 million to nine universities and 82 community colleges to establish curricula under the banner of the ONC’s ambitious Workforce Development Program. No one questions the demand for such HIT expertise as individual providers, clinics, and hospitals carry out the daunting task of switching from paper to electronic records as part of the quest to meet federal meaningful use criteria. The ONC expects its tuition assistance and other educational grants will help train some 10,500 HIT professionals from community colleges and another 1,500 from university-based programs by year’s end. This marks the initial efforts among the nation’s medical and technical schools to fill a workforce demand that the ONC expects to reach 50,000, according to Jessica Ancker, PhD, codirector of Weill Cornell Medical College’s six-month HIT certificate program, which last year graduated its first class of 26 students in collaboration with 51 trainees from Columbia University. Cornell is now training its second cohort of HIT students—doctors, nurses, allied health professionals, billers, and coders, along with IT support people and computer programmers—most of whom, like their brethren in the inaugural class, have seen their $12,500 tuition bill paid for courtesy of the ONC grant. That funding will expire by year’s end, which means the class entering Cornell in July must find a way to pay one-half the tuition on its own. Students enrolling after that must fund the entire amount. Those planning to remain with their present employers may be fortunate enough to obtain tuition reimbursement. Cornell’s six-month training program combines distance learning in the form of online lectures and exams with classroom sessions held one Saturday per month at its New York City and Ithaca, New York, locations that are linked by a Web-based teleconference. This works out nicely for those with full-time jobs who can do their schoolwork on nights and weekends and still pay their bills. The on-site sessions feature guest lecturers, including industry experts and hospital specialists, as well as team-based learning activities, says Ancker. There are also case projects tailored to match real-life scenarios. One such exercise requires students to create an EHR implementation plan while keeping to a tight budget. “They actually have to apply project management principles as well as what they’re starting to learn about clinical workflow to create a plan to move a small practice from paper records all the way to electronic health records and we hope all the way to meaningful use,” Ancker says. Other projects involve training on the infrastructure needed for exchanging health data across institutions as well as case studies on public health reporting of electronic data. 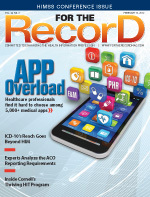 Additional projects focus on security and privacy issues stemming from the EHR use. Many of these activities take place on site at institutions and hospitals that welcome students to observe their work. After such field trips, students present their observations to the class. Developing a curriculum from scratch that covered a broad array of highly technical and constantly evolving concepts posed considerable challenges and demanded much time and effort. Ancker says she was fortunate to have medical informatics expert Rainu Kaushal, MD, MPH, serve as her fellow program codirector. Together they worked to iron out some initial wrinkles and fine-tune a practical curriculum designed to prepare students for real-world HIT challenges. One idea was to reach out to multidisciplinary specialists within Cornell and elsewhere in the industry. For field trips, they divide students into small groups rather than squeeze a large and intrusive crowd into a tight clinical setting. “It just took a little more planning and organization until we were able to get that on the money,” Ancker says. That’s not all. Commencement day is more than an occasion to toss your cap in the air and head for your favorite restaurant. As they graduated their first classes, Cornell and Columbia held a joint job fair with employers advertising more than 200 job openings. Ancker and her colleagues also disseminate job opportunities on their LinkedIn group’s site, which has also become a de facto channel for good news from graduates already in the field. “Every time one of my students gets a job and they update their LinkedIn account, I can see that,” Ancker says. A growing demand for well-educated HIT professionals suggests that Cornell’s training program and those at other institutions will likely be self-sustaining even after the ONC’s grants expire later this year. Ancker envisions gratifying opportunities for the young and the seasoned alike.